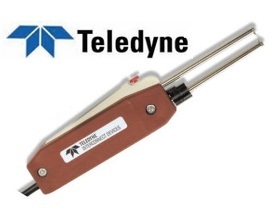 Teledyne Impulse TW-2 wire stripper is designed to remove a variety of insulation types, quickly and easily, without nicking the conductor or damaging the existing insulation. The extra long electrodes provides a longer reach into difficult to access areas. For a wire stripper with a temperature control see the TWC-1 . Electrodes are 2 inches longer than the standard Stirpall wire stripper.